To reach the processing capabilities required for meaningful quantum information science it is necessary to scale up information content that we can handle. To this end, considerable efforts were devoted to increasing the number of qubits (the simplest unit of quantum information) in nonclassical systems such as ultracold atoms and superconducting circuits, however, there is a complementary approach that is to move from two-level (qubit) to multilevel (quDit) systems. 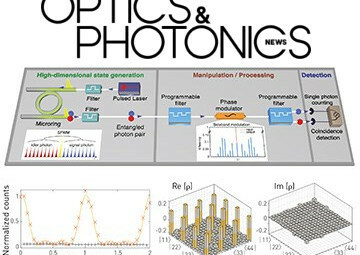 To address the concerns for the high coplexity and cost of solid state qDit devices, in recent years, researchers have studied and demonstrated photonic quDits using, for example, orbital angular momentum as well as the temporal or spatial degree of freedom, although these techiques are still not applicable to scalable and modular optical systems based on fiber and integrated-photonics components . In recent work, we demonstrated on-chip generation of entangled quDit states and their coherent control, by creating photons in a coherent superposition of multiple frequency modes via spontaneous four-wave mixing within an integrated microcavity. Using off-the-shelf telecommunications components, we obtained a quantum system with at least 100 dimensions, formed by two entangled quDits with D = 10. 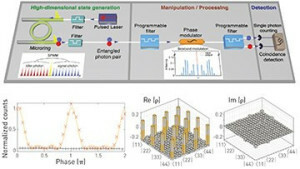 Our results suggest that microcavity-based high-dimensional frequency-bin entangled states and their spectral-domain manipulation can constitute a powerful yet practical platform for reaching the processing capabilities required for meaningful quantum information science.